With everything from swimming with the dolphins, to picking your own strawberries or enjoying a wander through fine art galleries, the Mornington Peninsula has you covered. …our luxurious environment includes single and double treatment rooms, a unique wet room with a handcrafted treatment bed, hydrotherapy qeisha tub and outdoor treatment areas available in summer. 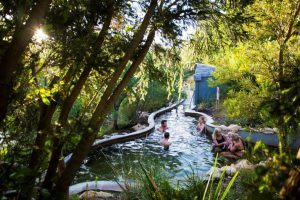 … natural hot springs and day spa destination on the Mornington Peninsula. Natural thermal mineral waters flow into the pools and private baths at our coastal oasis, providing an idyllic setting for relaxation and rejuvenation. …Sip & Sail on a Sunset Cruise or join a day sailing cruise on our stunning catamaran Dolphin ll. You will experience the stunning features of the Southern Mornington Peninsula’s Port Philip Bay. …board a state-of-the-art gondola at the Arthurs Seat Eagle and enjoy the breathtaking view across the bay to the city as you soar high above the trees. Tickets are available for purchase at the motel reception. …is the home of The Diggers Club and showcases the best flowers and plants for Australian conditions with wonderful planting combinations of summer perennials and heirloom vegetables. …lovingly hand-crafted daily on our Flinders premises, our sumptuous chocolates are created using only the finest local and imported ingredients. … an adventure wonderland with amazing gardens, mazes, bush scramble obstacle courses, thrilling tube slides and tree surfing. …we produce Australia’s biggest strawberries. Pick your own between Nov – Apr. Visit the showroom and sample the strawberry fare at other times. …experience fresh air, gentle horses and horseback trail riding through beautiful coastal bush-lands and spectacular beaches. …located at the very tip of the Mornington Peninsula, the park is truly one of Victoria’s beautiful natural landscapes with outstanding coastal scenery. …features an 18 hole golf course situated on a flora and fauna reserve. The picturesque course winds through many water features which makes the course both challenging and interesting for both golfers and nature lovers. …from the smiles on first-time players’ faces, to the eager return visitors keen to conquer the layout, we’re confident Eagle Ridge presents something different to all golfers, and ensures a great day out on the famed golfing turf. …perched high on the cliff tops, with views across Western Port to Phillip Island and the rugged Bass Strait coastline, the course provides a stunning panorama while strolling the fairways of this unique golf course. …set on 300 acres of gently rolling sand dunes, the 27 hole golf facility at The Dunes is Australia’s premier public access course. Accolades include being ranked among the Top 20 courses in Australia for the past 15 years. …located in ‘The Cups’ region and metres from the thundering surf of Gunnamatta Beach, it is built on a stunning piece of land that lends itself perfectly to the tradition of the famous links courses of Britain and Ireland. …Bay Views is arguably Victoria’s best kept golfing secret. Boasting panoramic views of The Bay and Peninsula, our 18 hole, 5,268 metre public course offers players Santa Anna couch fairways in excellent condition.